...creates the fragrance of a magic rose with a breakthrough formula. It blends the essences of the Moroccan Splendens roses, absolute of May roses and pure vanilla to recreate, by magic, the scent of the Ayrshire rose Splendens, an ancient rose well known for having exquisite and extremely rare notes of myrrh. It was also inspired by an inscription on the Porta Alchemica in Rome and by the Dracaena tree, also known as "the dragon's tree," which produces a red sap ("dragon's blood"). All this scene-setting aside, Cinabre is an oriental rose that unfolds like a crimson satin fan. Its composition includes notes of ginger, black pepper, pink pepper, Splendens rose, Moroccan rose, benzoin, vanilla and opoponax; if that list appeals to you (as it did to me! ), you should try Cinabre, because it's an accurate summary of what you'll actually smell. The ginger is warm and natural-smelling. If you like peppery-woody rose fragrances like Perles de Lalique, you'll enjoy Cinabre's pepper phase. The opoponax, or "sweet myrrh," wafts into the picture gradually. It smells (to me) bitter as well as sweet, in that mysterious way that resins sometimes have. If Cinabre's initial stages, with their spice and their bite, are more gender-neutral, its rose-vanilla heart is unabashedly feminine. It has an old-fashioned, Old World sensibility — which, as you can guess, is always a compliment coming from me. By the time it reveals its mid notes and base notes, Cinabre has a very "vintage" feeling, like an old bottle of some lesser-known Caron or Rochas fragrance. The opoponax turns powdery, and the roses are just slightly dusty. The resinous notes keep the vanilla from turning gourmand. Cinabre has very good staying power on my skin, and eight hours after application, I can detect subtle traces of smoky vanilla. This fragrance has been an ideal companion for a unseasonably gray and chilly week, when I can still wear sultry scents before the summer heat arrives in full force. I certainly own enough rose fragrances of all types, but if I had easy access to a small bottle of Cinabre, I'd be tempted to add it to my collection. (I wish a United States-based vendor would pick up the line's 7 ml bottles!) For now, at least, I'm enjoying the last drops of my sample. Maria Candida Gentile Cinabre is available in 7 (€14), 15 ($45) or 100 ($185) ml Eau de Parfum. For buying information, see the listing for Maria Candida Gentile under Perfume Houses. 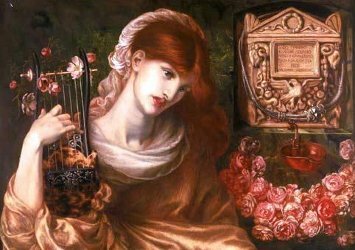 Note: top image is Roman Widow' ('Ds Manibus') [cropped] by Dante Gabriel Rossetti via Wikimedia Commons. This sounds really nice. I haven’t tried anything from this line, but I like a good rose and this one sounds right up my alley. I like that they offer smaller bottles. It would be nice if anyone in the US stocked the 7ml size, but it looks like Indiescents has the 15ml bottles for $45, which isn’t too bad. I know it’s a constant refrain here at NST — but we really do like small bottles! Great review, Jessica. I just checked out Indiescents myself – thanks sweetgrass! They’re new to me. I should re-try this at Bendel’s before they go pouff! My favorite Maria Candida Gentile is Noir Tropical which is vanilla-based. I love the idea of the 15 mLs. Great review! Ugh, I still can’t believe they won’t be carrying cosmetics or fragrances anymore. What a shame. They’ve always had some wonderful lines there. This is one of the MCG scents on my “to try” list and you have only furthered my interest. I guess I need to get ordering. Great review, Jessica! It’s been on my “to try” list for a while — the MCG line is really growing on me! I really like Exultat, the violet-incense one. I have samples of most of the others and need to devote some time to them. Exultat is next on my MCG list — I have a sample now. I can rarely resist a violet fragrance! Oh Jessica, I can’t thank vou enough for introducing me to Cinabre! In the gardens of the castle in Schwerin, Germany, grows a certain type of old garden rose with the best fragrance I have ever smelled: Deep and heady, magical. I went to Twisted Lily to try Cinabre yesterday and…….there it was! The scent of those roses in Schwerin! Cinabre has many more aspects to it, of course, but those roses are definitely there. Elizabeth, that is beautiful — I’m so glad Cinabre will help you to hold that memory!! I know that sweet myrrh and myrrh are not the same thing, but I visited a friend yesterday and she her myrrh-scented rose bush is blooming. Very nice. She only plants roses if they are scented. Oh, and thanks for the great review. I’ve been meaning to sample this one. That must be a wonderful garden! Some of my neighbors on my city street grow roses in their little front yards. I like to stop and take a sniff on my way to the bus in the morning. I don’t know any of the breeds, but some of them do smell great! One of my summer projects hopes to be finally starting my garden at my not-so-new house. I also had the idea of using mostly fragranced plants, but as my yard is mostly shaded, I’m beginning to think I won’t have that many options! I will keep looking for scented plants, but I will probably have to fill things out with plenty of things that just won’t die.